# 3 on the 10 most affordable cities for homebuying list! The capital of Indiana is an important auto industry supplier, with transmissions, starters, gaskets and other parts still manufactured here. As the auto industry has revived, so has the local economy. The city also has benefited from having diverse industries: Pharmaceutical makers (Eli Lilly), financial services firms (Conseco), the state government, and communications companies (Brightpoint) are all major employers. And the job market is improving: Unemployment fell in September to 6.4%, 1.5 percentage points below the national rate of 7.9%. That’s great news for job seekers, but home buyers may not be quite as happy. A few years ago, Indianapolis regularly led the affordability index; it’s since slipped a couple notches. Still, Indianapolis is the largest metro area of the 10 most affordable cities. Ready to buy or sell? Let me help! Click here for my website and let’s get started! Shop Local – it will give you a glow! More good news in housing market! This article was released today on MSN…ready to make a move? Click here to visit my website, I offer FREE market analysis for your home and can also help you get the best deal if you are ready to buy! Nationwide, the median price for a home was up 11.1 percent from a year earlier as fewer people sold their homes under distressed conditions. WASHINGTON – Home resales unexpectedly rose in October, a sign that slow improvements in the country’s labor market are helping the housing sector recovery gain traction. The National Association of Realtors said on Monday that existing home sales climbed 2.1 percent last month to a seasonally adjusted annual rate of 4.79 million units. That was above the median forecast of a 4.75 million-unit rate in a Reuters poll. NAR economist Lawrence Yun said superstorm Sandy, which slammed in the U.S. East Coast on October 29, had only a slight impact on home resales. The only region where the pace of sales slipped was the Northeast. But Yun said the storm could temporarily hold back the pace of sales in November and December. Nationwide, the median price for a home resale was $178,600 in October, up 11.1 percent from a year earlier as fewer people sold their homes under distressed conditions compared to the same period in 2011. Distressed sales include foreclosures. The nation’s inventory of existing homes for sale fell 1.4 percent during the month to 2.14 million, the lowest level since December 2002. At the current pace of sales, inventories would be exhausted in 5.4 months, the lowest rate since February 2006. The price increase last month was measured against October 2011, and since then distressed sales have fallen to 24 percent of total sales from 28 percent. The share of distressed sales, which also include those where the sales price was below the amount owed on the home, was flat from September. …because you don’t know anything about cars except how to fill your tank? Take your vehicle to the guys at Indy Tire NW, Ron and the other gentlemen who work there are so fantastic that even though I no longer work in their area, I make the trek from Beech Grove for my tires, rotations, oil changes and just about anything else my car needs. When I had transmission problems (which they don’t handle), they directed me to the another shop and I was treated with the same respect I receive from them. I recently needed new tires and called and spoke directly with Ron (the manager) and we discussed options – I’ve been taking my car to them for a long time and he knows I’m a Realtor (click here for my website!) – he presented me with 2 options and we discussed everything allowing me to make the best decision for myself. Never once in my dealing with this shop has anyone made me feel “stupid”, my budget, time and safety are always taken into consideration. Need to leave your car? they will take you to your office and pick you up later in the day. They’ve even driven me to an appointment and picked me up after…now that is service! Please everyone, if you want great auto service, visit the shop of Indy Tire NW! I am often asked where I think home prices are headed over the next year. Reality is that we don’t know, with the election behind us, we can only hope it continues to improve! Think it might be time for you to make a move? Call, text or email me – click here to visit my website for contact information! I recently relocated to a new cube in our office. Gone are the days when building/facility folks would bring up the carts to help you. I even moved my own technology and phone! That was the most manual labor I’ve done in a long time. Since I’ve been with the same company for 30+ years I’ve learned to give up ‘stuff’ and only had two boxes to move – including hard copy files (I know there’s an e-copy but there’s some things you just have to keep). I have a few work mementos: a conference room sign from the first building I worked in, my notary certificate, a 30-year achievement award, pix of kids & grandkids, a few favorite Dilbert comic strips, IU memorabilia and my “Whatever!! !” plaque. The candy dish is for when I’m feeling generous and actually buy some; rarely chocolate ‘cause it’s too expensive, I go for the old stuff: fire balls, orange slices, Werthers, cow tails, etc. 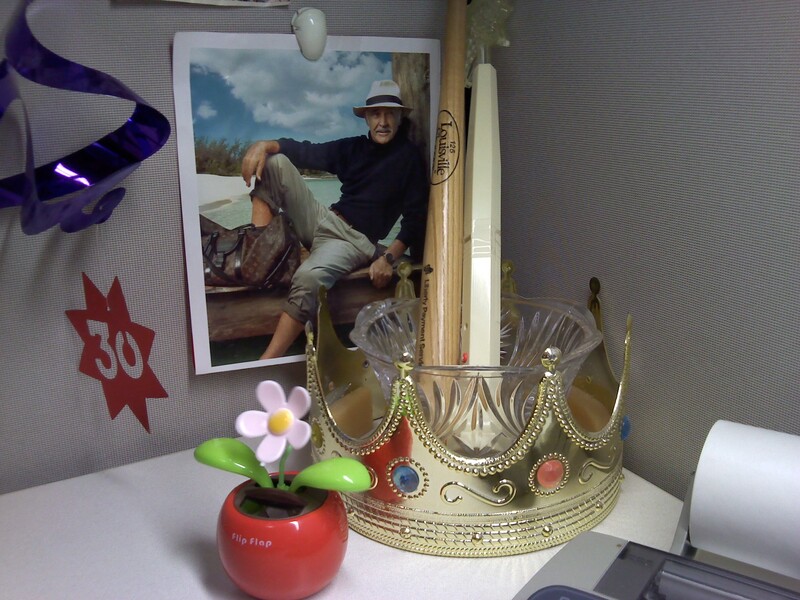 The crown and scepter are for when co-workers call me ‘Queen of . . . . “ – it’s usually nice and in fun. The Louisville Slugger mini-bat would come in handy if those pesky HR policies would let me use it. The Flip-Flap flower is there because it’s just soooooo cute! The picture of Sean – well it makes me smile and remember all the great movies he’s been in.